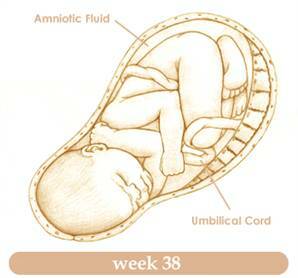 As you enter into the 38th week of pregnancy, you may start to feel some changes. The baby is getting ready to be born. Their head is now in the down position. Labor is a real possibility now so it is best to stick close to home and avoid driving too far from the hospital. You should be getting plenty of rest and relaxation. You should have all of your phone numbers handy and your bags packed for the hospital. At this stage of pregnancy, you should avoid stress at all times. If your partner works, you may have someone stay with you during the day in the event that you go into labor. Make sure that friends and family members are able to access all of your phone numbers too. During this stage of pregnancy, dad might come down with a case of the jitters. They worry about becoming first time dads and they may need to discuss their fears with their friends and family rather than with the new mom to be. Most dads do this because they don’t want to put any additional stress on the new moms to be. Some new dads to be often hide small gifts in the new moms hospital bag. When the new mom goes into the bag she finds a surprise gift on the day the baby was born. It really is a romantic and sentimental thing to do. 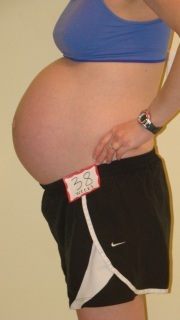 The baby is going to continue to grow in weigh and in length. The baby will be anywhere from 17 to 20 inches long and 6-1/2 to 7 pounds. Until the baby is ready to be born, she will continue to grow. All of the baby’s organs are now mature and functioning at 100%. It is interesting to know that although the baby’s lungs are mature, the lungs and the brain do not fully function until they are out of the womb. Both will continue to grow and developing even after they are born. The baby will be born with blue eyes. Eye color can change weeks after the baby is born. If in the course of the pregnancy you have developed hypertension, the amount of oxygen and food to the baby will have decreased . If the baby shows signs of losing weight or not gaining weight it could be due to the hypertension. The doctor would have addressed this concern with you by now if you did develop hypertension. The baby blinks and clenches their fists at this week of pregnancy. The baby will react to light and to the sounds of the moms voice and familiar sounds. The baby fat is now developing to keep in the baby’s body temperature both inside the womb and outside as well. In week thirty-eight you are going to experience some changes both inside and outside. When you enter the last few weeks of the pregnancy, you may start to see some swelling of the feet. Don’t panic, swelling is normal at the end of the pregnancy. If you start to see some swelling in the hands and face, then contact your doctor, it could be the start of induced hypertension or pre-clampsia. This is when the placenta is not getting enough blood or oxygen it requires. If not treated right away, it could be a dangerous condition. You may be experiencing some heartburn still and frequent urination. Don’t try to lessen the amount of water that you are taking in. You may be tempted to because it could help with your frequent urges to urinate. This problem will soon be a thing of the past. You may be finding it harder to become comfortable either sitting, standing and especially lying down. As the pregnancy progresses, you may have found a way to get comfortable. Practice your kegel exercises. These will help with the delivery of the baby. If you are still experiencing heartburn, continue to adjust your meal schedule. Try eating lighter meals and stay away from the heavy meals until the baby is born. After you eat, try taking a short walk but always go with a friend or partner. You never know at this point in pregnancy if you are going to go into labor. You can expect to talk to your doctor about childbirth. If something goes wrong, have a plan ready. Some doctors won’t discuss that but it does ease the new mom to be. You should expect to continue going to the doctor at this point in time. Don’t miss any appointments that they set. It is important that you attend these appointments. If you are considered to be a high risk, the doctor is monitoring you closely especially if you also have gestational diabetes or high blood pressure. There is very little room for the baby to move around. It is getting tight and the baby is on their way to being born. Continue to eat healthy and take your supplements and prenatal vitamins. The doctor may think it is a good idea to go through a stress test, this is normal but sometimes it is necessary. You should be enjoying the mother child bond now and the baby can kick when you speak. They recognize the sound of your voice. Continue to listen to your body. Only you can know when there is something wrong. Continue to attend doctors’ appointment, you can still hear the heartbeat at every appointment and the doctor will still monitor you until the day you go into labor. So don’t worry about anything at this stage. Let the doctor worry about things, all you have to do is rest and relax in these next few weeks. The end of the pregnancy is in sight. Your doctor will let you know if there is something to worry about. Until it is time to go to the hospital, take it easy and relax.